OSAGYEFO DR. KWAME NKRUMAH (1909-72) Founder and Father of the Nation Osagyefo Dr. Kwame Nkrumah, the first Prime Minister and President of Ghana, stands out not only among the Big Six but also among the greatest statesmen of history. 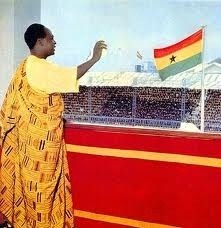 It was he who canalized the discontent of the people of the Gold Coast Colony into the highly organized movement of protest against British rule, and within a relatively short period won political independence for Ghana on March 6, 1957. 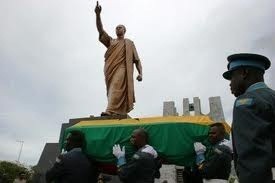 With Ghana independent, Nkrumah worked to liberate the whole of the African Continent. He supported and financed liberation struggles and nationalist movements throughout the continent. His efforts soon yielded dividends as the majority of countries on the continent gained independence. 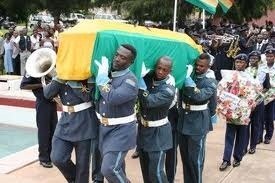 Then he turned his efforts to forging a common union of African states. He supported and financed liberation struggles and nationalist movements throughout the continent. His efforts soon yielded dividends as the majority of countries on the continent gained independence. Then he turned his efforts to forging a common union of African states. 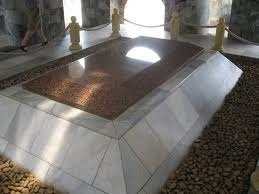 This he believed was the key to giving a strong voice to the whole continent and pride of place to the Blackman. Indeed Nkrumah's contributions are legion Apart from being a brilliant leader of the ordinary people and a great champion of their cause, he is remembered as an outstanding statesman of Ghana and Africa who stands shoulder to shoulder with such great leaders of the twentieth century as V.I. Lenin of USSR, Mao Tse-tung (Zedong) of China, Fidel Castro of Cuba, J.F.K. Kennedy of USA and Winston Churchill of Britain. 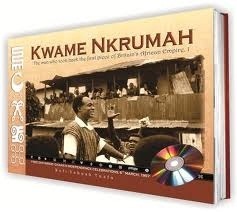 Kwame Nkrumah was born on September 21, 1909, at Nkroful in the Western Region. His father had many wives and children but he was his mother's only child. Throughout his life his mother, Elizabeth Nyaniba, served as a tower of strength to him. "I never cared for any woman as much as I cared for her. We are both alike in one thing. We seem to draw strength from each other. 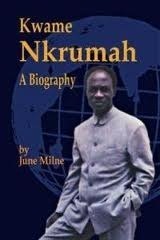 Nkrumah wrote about his mother. 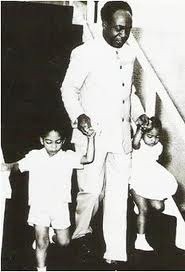 When Nkrumah was about three years old his mother brought him to HalfAssini, where his father worked as a Goldsmith. He began his schooling at the local Catholic School where he was also baptized and named Francis. On completing his course as a top student in his class, he was given a pupil-teaching appointment at a Primary School in Half Assini. In 1926, the Rev. A.G. Fraser, an educationist, visited Nkrumah's school. So impressed was he about Nkrumah's output that he recommended that he should go for further studies at the Accra Government Training College. At that College, Nkrumah came under the influence of Dr. Kwegyir Aggrey who helped him tremendously to come out of his depression and financial crisis which had been commissioned by the death of his father in that same al year. When in 1928, the Accra Training College was moved to Achimota and made part of p the Prince of Wales College, Nkrumah was enrolled and began working hard to catch up with his new mates most of whom had finished secondary school. Among his favorite subjects c were history and psychology. Outside the classroom, he was active in the Aggrey Students' Society (a debating society). He was also very active in sports and ran for the College in I the 100 and 200 yards dashes. He graduated j from the College in 1930 and his career in 1 teaching began at the Roman Catholic Junior ! School in Elmina. ' As a teacher, he was reckoned to have pedagogical gifts. Basil Davidson, a biographer of Nkrumah, quotes a former school inspector who once sat in a lesson given by the young Nkrumah to prove that point: I have never forgotten our meeting since I was suddenly made aware that here was no ordinary teacher. Despite a frieze of noisy spectators at the open windows, the pupils reacted to his calm, dignified and "magnetic" manner whole-heartedly. It was an unforgettable inspectorial experience. 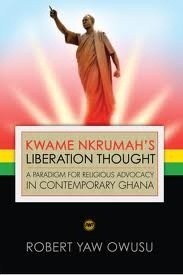 While teaching at Elmina, Nkrumah used much of his spare time to help found the Teachers' Association. This Association aimed at improving the status of teachers, supplying them with the means of airing some of their grievances and getting them remedied by the authorities. After one year in Elmina, he was transferred to Axim and made the headmaster of the local Roman Catholic Junior School. While there, he took a private course to prepare himself for the University of London Matriculation . He, however, failed the Latin and Mathematics papers of that examination. In 1933 the Roman Catholic Mission in Ghana opened a seminary at Amissano near Elmina to train its priests. As one of the brilliant young teachers of the Church, he was invited to teach there. Amissano was to have considerable influence on him as he regained his religious fervor, which he had almost abandoned. He even formed the idea of joining the Jesuit Order and taking the vocation of priesthood. This idea lingered on in him for a whole year but eventually it was replaced by the old desire of furthering his education. 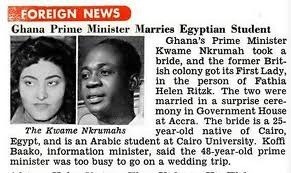 For the place to go overseas, Nkrumah chose the USA . He had around that period come into contact with the views of a foremost African nationalist, Nnamdi Azikiwe (Zik), who was then editor of The African Morning Post. Zik's ideas greatly influenced him. So just like Azikiwe; who schooled in the USA, he saw USA as an ideal place to go in order to get a first hand knowledge of liberty and equality At the close of 1934, he applied for admission to Lincoln University, the first institution of higher learning for blacks. His passage money was provided by two relatives: the Chief of Nsuaem in the Wassa Fiase State (northwest ofTarkwa), and another who had moved to Lagos, Nigeria . Nkrumah arrived in New York towards the end of October 1934 and began his studies in Economics and Sociology at the Lincoln University . In 1939 he obtained his B.A. degree with major in Economics and Sociology, and in 1942 qualified as Bachelor of Theology. He proceeded to the University of Pennsylvania in Philadelphia where he obtained an M.Sc. degree in Education and an M.A. in Philosophy. While at the University of Pennsylvania , he helped to set up the African Studies section there. He also helped to organize African students in America and Canada into an African Students Association of America and Canada . At the first congress of the Association, he was , elected its president. In the course of his organizational work, he met C.L.R. James, a historian of note from Trinidad, then living in 'the USA . Through James, he learned about political organizations and took deep interest in the writings of Marxists and other revolutionary philosophers. He was particularly inspired by the thoughts of Marcus Garvey, the charismatic Jamaican who initiated a Back-to-Africa movement, and of Dr. W.E.B. Du Bois who in his capacity as one of the founders of the National Association for the Advancement of Colored People was writing authoritatively on African Affaires.